Click above to visit WPGC today. Dan Mason began his career in radio doing overnights at WVLK in Lexington. From there he went ot KIRL in St. Louis. Then on to KBEQ in Kansas City followed by WKLO in Louisville. In 1974 he moved to nights at Z-93 / WZGC-FM in Atlanta. He was later named Asst. PD and became Program Director in 1975. Dan joined WPGC in May of 1977 when the Great Strike That Struck Out occured. He continued as Program Director after being named the National Program Director for First Media until he left for the General Manager position at KTSA / KTFM in San Antonio in 1979. He later returned to First Media where he was named Executive Vice President. When First Media became Cook Inlet Radio Partners, he was named that organization's President in 1988. In 1993, he joined Westinghouse as President of Group W Radio. He was named President of CBS Radio (renamed Infinity Radio) in November of 1995 where he was responsible for the operation of the group's 184 stations in the largest markets across the United States. As President of Infinity Radio, he successfully integrated the original CBS, Group W and American Radio Systems stations, among the most venerable radio broadcasting groups in the country, by merging operations, blending business styles and increasing profitability. Dan has previously served on several boards including the National Association of Broadcasters (NAB) and CBS Marketwatch.com. A native of Louisville, Kentucky, Dan Mason graduated from Eastern Kentucky University with a Bachelor of Science degree in Broadcasting. He was named that university's "Outstanding Alumnus of the Year" in 1995. In 2002, he was named Radio Executive of the Year by Radio & Records Magazine. Dan then formed a partnership with longtime radio programmer, Walt Sabo, Sabo-Mason International Inititatives. In March 2007, he was once again named President and CEO of CBS Radio, overseeing 144 properties nationwide. Dan retired from CBS in April, 2015 and plans on doing select college basketball games in the future. Read more about his retirement at NOW, RAMP and FMQB. Read an archived interview with Dan in Friday Morning Quarterback on 08/24/07. In the beginning it was total chaos...I got into town about midnight just as the strike began...I did morning drive the first morning and Bill Prettyman was reading the news believe it or not.....He sounded pretty good by the way...Little by little we hired new people...Dave Foxx came from our Provo station...we hired Brandt Miller to do afternoons...Waylon Richards had worked with me a few years before in Kansas City and finally Liz Kiley came from Grand Rapids,. I believe she was a former school teacher. Within 4 months, the staff began to gel and within a year, WPGC had tied WMAL for the number one position in the market....It was quite an accomplishment...I left to take a VP/GM job at KTSA / KTFM in San Antonio and Scott Shannon came in and even made it a better station. My duties had increased when I was the National PD for First Media...We had acquired KOPA in Phoenix, WZLX in Boston, WUSN in Chicago, KFMK in Houston and KUBE in Seattle....That meant much more travel and I wasn't physically there to do an airshift at WPGC anymore...I still did Thanksgiving and Christmas shifts so the full timers would have some holiday time off...And I did afternoon sports on Brandt Miller's show when I could...We sold that report at 5:30PM. Uncle Richard - When Star Wars came out..we went out and got a 55 gallon drum and painted it blue...Smitty and Newt put lights all,over it and we had a triple decker cart machine with Star Wars type respones ...We actually had someone get into the drum to run the equipment...We took it on remotes...Last I heard, the drum is still at the transmitter building ...no doubt gathering a lot of dust. Many stations at that time were successfully coverting to AC from CHR..WNCI in Columbus is the best modern day example of this...They have great adult numbers...It was a gamble but with Q107 pounding us on the younger end, we thought we could migrate to the 25-34 women demo. Click on images to see enlargements. 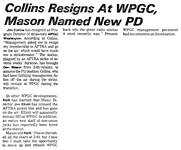 "Collins Resigns At WPGC, Mason Named New PD"
(Special thanks to Jonathon Wolfert for the above). People: Jim Collins, Bill Prettyman, Bill Travis, Don Bishop, Jim Elliott, Don O'Day, Scott Woodside, Dave Foxx, Brandt Miller, Scott Carpenter, Waylon Richards, Steve Michaels, Liz Kiley, Scott Shannon, Al Casey, Smitty, Jerry Clifton, Steve Rivers & JR Nelson. Promotions: Ramblin' Raft Race, Toys for Tots Concerts, the 'Uncle Richard' Promotion and the Unknown Star Contest. Plus: His Early Days in Radio, The Great Strike That Struck Out, Coming off the Air to Become National Program Director, Leaving Programming to Become a General Manager, WKLO, WMAL, Q107, WASH, WKYS, OK-100, Z93, KFMK, WUSN, Changing the Format to Adult Contemporary, bringing back the WPGC calls & Going Urban. Small Print Dept. 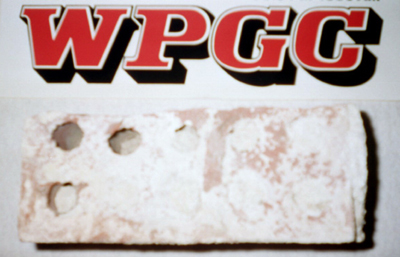 : This non-profit historical site is not affiliated in any way with WPGC Radio today or CBS Radio, Inc. Use of copyrighted material is consistent with the "fair use" provisions contained in §107 of the Copyright Act of 1976 due to the following characteristics: Use of copyrighted material is of a nonprofit, educational nature, intended for the sole purposes of research and comment and does not significantly negatively affect "the potential market for or value of the copyrighted work(s)." Use of registered trademark material is not subject to civil action or injunction as outlined in §1114 and §1125 of the Trademark Act of 1946 (the Lanham Act) due to the following characteristics of this work, and the registered marks published herein: Use of reproductions of registered marks is not for the purpose of commerce, nor is the use connected with the sale, offering for sale, or advertising of any goods or services. Use of reproductions is not likely to cause confusion, mistake, or deception as to the affiliation, connection, or association of this work with owners of published registered marks, nor as to the origin, sponsorship, or approval of this work by owners of published registered marks. Wherever possible, the copyright or registered mark owner's name has been noted near the copyrighted work or registered mark; however, all material used in this site, including, but not limited to, newspaper articles, syndicated themes, promos, commercials, photographs, playlists, press releases, ratings, airchecks, newscasts, traffic reports, sports reports, 'sound-offs', sweepers, bumperstickers and station logos, should be considered protected copyrighted material or registered mark with all rights reserved to the owner, named or unnamed. So there!